I have a bit of a thing for boxes. I love sorting stuff into them and stacking them up on shelves. I love the way they make a room seem tidier somehow (no matter the multitude of sins that may hide inside them). I keep all sorts of boxes because they “may come in handy one day”, so there are piles of clean, empty boxes stashed all over the house. You can never have too many useful boxes! When Eeyore saw the pot, he became quite excited. “Oh, no, Eeyore,” said Pooh. “Balloons are much too big to go into Pots. What you do with a balloon is, you hold the balloon”. “Not mine,” said Eeyore proudly. “Look, Piglet!” And as Piglet looked sorrowfully round, Eeyore picked the balloon up with his teeth, and placed it carefully in the pot; picked it out and put it on the ground; and then picked it up again and put it carefully back. I’m a bit like Eeyore – I love putting things in and out of boxes. So it is not surprising really that I love making boxes. 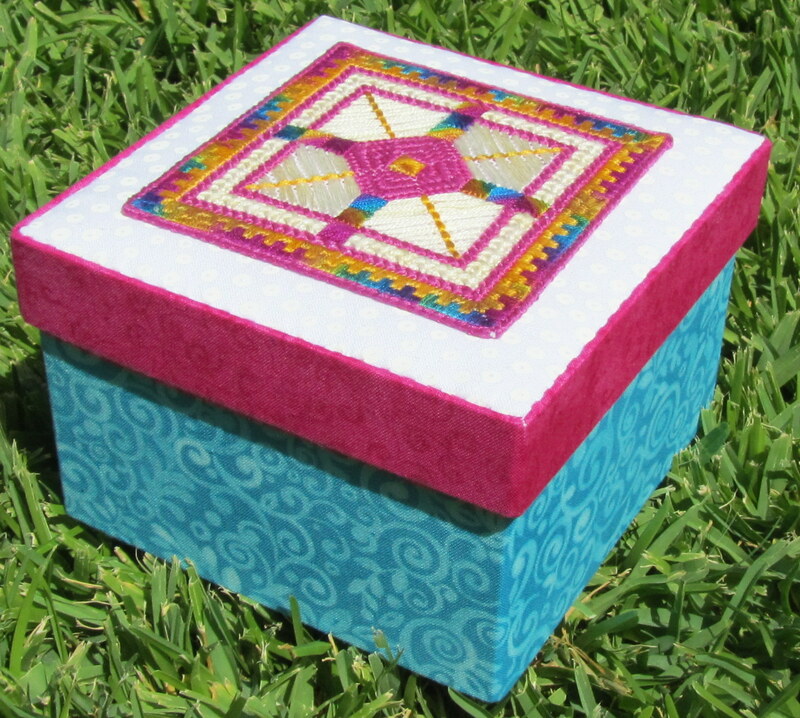 Next week I am teaching a class on making fabric covered boxes at the Embroiderer’s Guild of Western Australia. For many years, this class has been taught by a wonderful lady, Rene Sinclair. Rene recently moved to Hawaii. I was very honoured when she asked me to take over running the class. I haven’t made any boxes since before Christmas, so I wanted to refresh my memory before next week. Do you remember the small pieces of canvaswork I was playing with a few weeks ago? Oh happy serendipity – a small piece of canvaswork is perfect for mounting on a box lid. 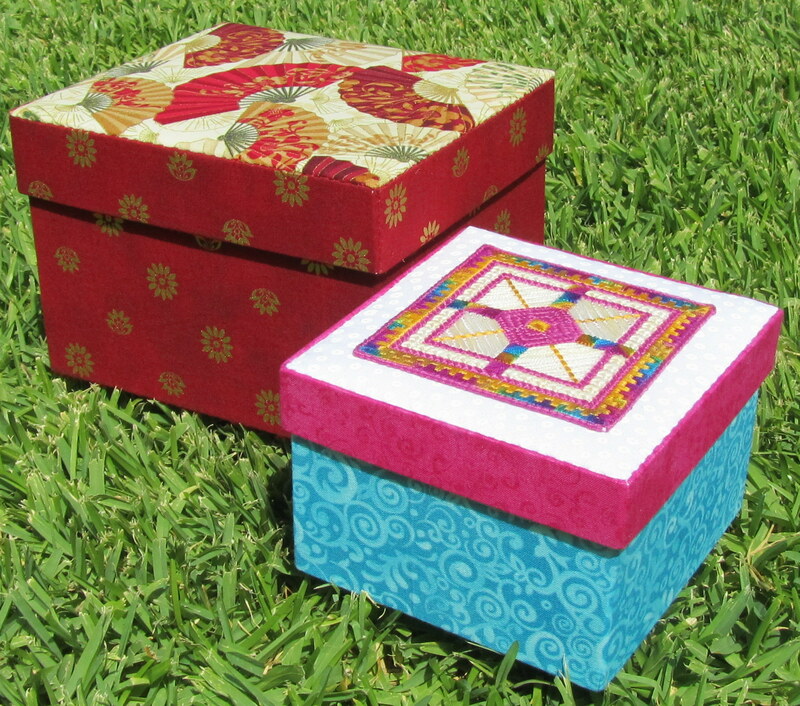 Fabric covered box topped with geometric canvaswork design. Completed size – 14cm x 14cm. Just to make sure that the techniques are completely refreshed and clear in my mind, I also made this slightly larger box. 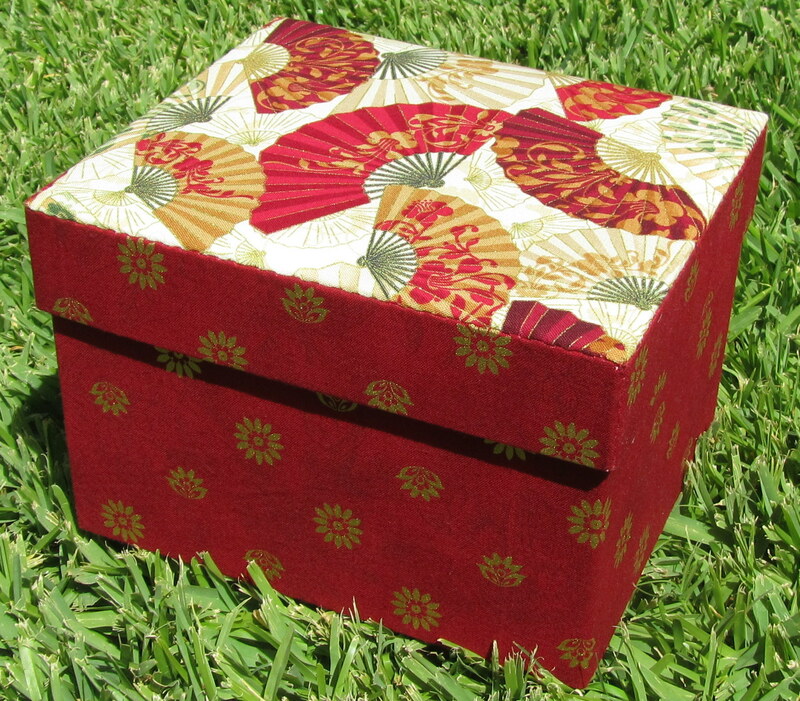 Fabric covered box. Completed size – 19cm x 16.5cm. Two useful (and beautiful) boxes. That’s it. I want to have a “pretty box making” working bee.